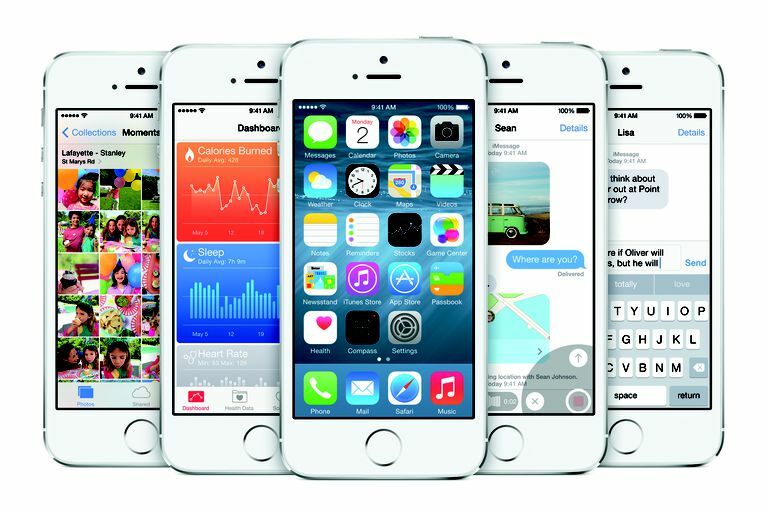 While the iPhone 5S strongly resembles its predecessor, the iPhone 5, it introduces a number of key changes. While many of them are under the hood and thus can't be seen —these include a faster processor and improved camera, for example — there are plenty of changes you can see. If you've upgraded to the 5S, or if this is your first iPhone, this diagram will help you learn what each port and button on the phone does. Ringer/Mute Switch: This small switch on the side of the iPhone lets you put it into silent mode, so you can receive calls with the ringer muted. Antennas: There are a number of thin lines along the sides of the 5S, mostly near corners (only one is marked on the diagram). They are the externally visible parts of the antennas that the iPhone uses to connect to cellular networks. As with other recent models, the 5S has two antennas for greater reliability. Front Camera: The small dot centered above the screen and just over the speaker is one of the phone's cameras. This one, primarily used for FaceTime video calls (and selfies! ), takes 1.2-megapixel images and 720p HD video. Speaker: Just below the camera is this small opening. It's where you listen to the audio from phone calls. Headphone Jack: Plug your headphones in here for phone calls or to listen to music. Some accessories, such as car stereo cassette adapters, are plugged in here. Hold Button: This button on the top of the 5S does a number of things. Clicking the button can put the iPhone to sleep or wake it. Hold it down for a few seconds and a slider appears onscreen that lets you turn the phone off (and — surprise! — turn it on again). If your iPhone freezes up, or you want to take a screenshot, you just need the right combination of the Hold button and Home button. Volume Buttons: These buttons, located below the Ringer/Mute Switch, are for raising and lowering the volume of any audio playing through the 5S's headphone jack or speakers. Home Button: This small button is central to a lot of things. On the iPhone 5S, the major new thing it offers is the Touch ID scanner, which reads your fingerprint to unlock the phone or make secure transactions. Beyond that, a single click brings you back to the home screen from any app. A double click reveals the multitasking options and lets you kill apps (or use AirPlay, on older versions of the iOS). It's also part of taking screenshots, using Siri, and restarting the iPhone. Lightning Connector: Sync your iPhone using this port on the bottom of the 5S. The Lightning port does a lot more than that, though. It's also the way you connect your iPhone to accessories like speaker docks. Older accessories that use the larger Dock Connector need an adapter. Speaker: There are two, metal-mesh-covered openings at the bottom of the iPhone. One of them is the speaker that plays music, speakerphone calls, and alert sounds. Microphone: The other opening at the bottom of the 5S is a microphone picks up your voice for phone calls. SIM Card: This thin slot on the iPhone's side is where the SIM (subscriber identity module) Card goes. A SIM Card is a chip that identifies your phone when it connects to cellular networks and stores some key information, such as your phone number. A functioning SIM card is key to being able to make calls and use cellular data. It can be removed with a "SIM Card remover," better known as a paper clip. Like the iPhone 5, the 5S uses a nanoSIM. 4G LTE Chip (not pictured): As with the 5, the iPhone 5S includes 4G LTE cellular networking for speedy wireless connections and high-quality calls. Back Camera: The higher-quality of the two cameras, this one takes 8-megapixel photos and video at 1080p HD. Learn more about using the iPhone's camera here. Back Microphone: Near the back camera and the camera flash there's a microphone designed to capture audio when you're recording video. Camera Flash: Pictures are made better, especially in low light, and colors are more natural thanks to the dual camera flash located on the back of the iPhone 5S and next to the back camera. Sensors (not pictured): A series of sensors inside the phone — including an accelerometer and compass — are used to have the phone respond to how you hold and move it, use your location to provide directions and suggestions, and more.